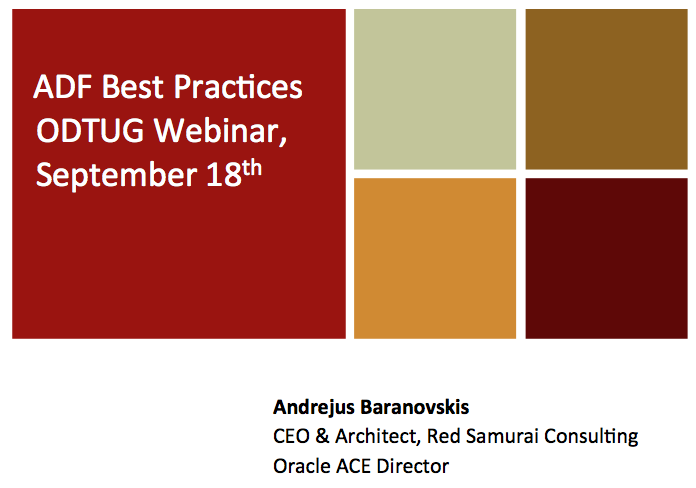 I have finished preparation for my ODTUG webinar next week - ADF Best Practices. Webinar will be hosted as planned - next week Tuesday (September 18th). 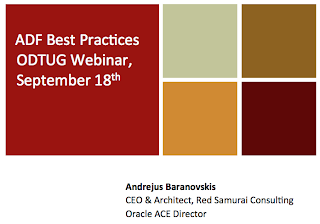 If you are not registered yet, you can complete registration form here for this free webinar - ADF Best Practices, Andrejus Baranovskis, Red Samurai Consulting. Read more about this webinar from here. thanks Andrejus for the pleasant Webinar, I am waiting for the topics discussed in the webinar. Also if you found a solution for my question regarding BLOB. Regarding your question - you will need to implement custom logic during passivation/activation to store BLOB into your custom table and then activate it by ID.